New York, August 22, 2014 -- The Committee to Protect Journalists calls on the Bahrain High Court of Appeals to overturn the baseless conviction of freelance photojournalist Ahmed Humaidan. The court is expected to rule on Humaidan's appeal on August 25, according to news reports. On March 26, a Bahraini court sentenced Humaidan to 10 years in jail on charges of participating in an attack on a police station. He has been imprisoned since December 2012. His family said authorities sought his arrest for months and raided his home five times in an attempt to arrest him, according to news reports. Humaidan, who published images on local opposition websites exposing police attacks on protesters, had been at the police station simply to document the attack, according to local human rights groups. For his coverage, Humaidan was awarded the U.S. National Press Club's John Aubuchon Press Freedom Award earlier this year. "The fact Ahmed Humaidan has already been in jail for 20 months is injustice enough," said CPJ's Middle East and North Africa program coordinator, Sherif Mansour. "It's time for the Bahraini justice system to live up to its name and free Ahmed Humaidan and all other journalists imprisoned in the country." On July 24, in a case not previously documented by CPJ, freelance photographer Ammar Abdulrasool was arrested and his camera confiscated during a house raid by plainclothes security officers, news reports said. The early morning raid was one of several in the village of Eker. Abdulrasool, an award-winning photographer, told his family he was tortured during interrogations about his work as a photographer. According to the Bahrain Mirror news website, Abdulrasool said he was bound, blindfolded, beaten, stripped, and threatened with sexual molestation and electric shocks during his interrogation. 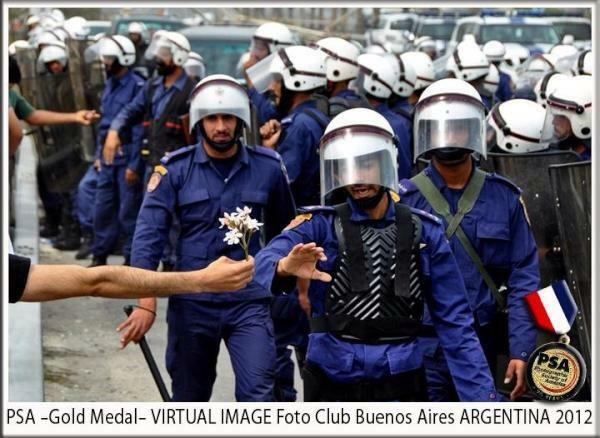 Abdulrasool has captured many iconic images of the popular uprising against the Bahraini government that began in the spring of 2011, including a photograph of a police officer refusing a flower from a protester. The journalist is being held in Dry Dock jail pending an investigation into charges of participating in riots and illegal assembly, the reports said. On June 1, in a case not previously documented by CPJ, Bahraini security forces arrested 15-year-old Firas al-Saffar during a raid on his house in Hamad City, according to news reports and human rights organizations. He is being held pending an investigation into charges that he was filming illegal protests. It is not clear which protests the charges refer to. On February 10, freelance photographer Sayed Ahmed al-Mosawi was arrested with his brother, Mohammed, in a house raid, according to news reports. He was transferred to Dry Dock jail after being interrogated about his internationally recognized work as a journalist. The journalist told his family in a phone call from prison that he had been beaten and given electric shocks, according to the Bahrain Center for Human Rights. The al-Mosawi brothers are being held together. It is not clear if they have been charged. Journalists writing for outlets affiliated with the government have also faced legal harassment. According to the Bahrain Journalists' Association, al-Ayam newspaper's editor-in-chief Isa al-Shaiji was summoned in June to the prosecutor's office after the Minister of State for Information Affairs, Samira Rajab, filed a complaint against the newspaper's coverage of a fire in one of the ministry's studios. Al-Ayam's founder, Nabeel al-Hamer, is a media adviser to King Hamad bin Isa al-Khalifa and a former minister of information. It has been more than three years since hundreds of thousands of protesters gathered in the streets in anti-government protests, sparking a government crackdown against the press and opposition voices. King Hamad approved the Bahrain Independent Commission of Inquiry in 2011 to investigate human rights violations and propose institutional and policy changes on the path toward purported reform. But the crackdown against the press continues to this day. On Thursday, a delegation including Human Rights First and U.S. Congressman James McGovern was refused entry into the country, Human Rights First said. The refusal comes a month after U.S. Assistant Secretary of State for Democracy, Human Rights and Labor, Tom Malinowski, was expelled from the country after meeting opposition leaders. EDITOR'S NOTE: The original version of this alert incorrectly stated that Al-Ayam's chairman of the board is Nabeel al-Hamer. He is the original founder of the paper but is not currently involved in its operations. The current chairman of the board is Najeb al-Hamer.